Selected from a pool of 8,000 applicants when she was hired in 1990, Hutchinson is one of only two African-American women working in San Diego’s 1,100 member fire-rescue unit. Though she has spent the bulk of her adult life extinguishing physical and emotional blazes for others (first as a medical assistant in the mid-1980s), she was stunned to learn that she would be on the receiving end of care when she was diagnosed with breast cancer in November 2012. “I usually took care of people, and now I had something that could possibly kill me,” she says. 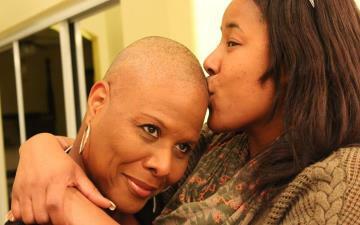 Second to lung cancer, breast cancer is the most common cancer among African-American women. And while incidences of breast cancer occur at a higher rate for Caucasian women, Black women are 41 percent more likely to die from the disease than their White counterparts. While barriers to health care access are among the culprits for this gap, researchers count health behaviors (such as getting yearly mammograms and clinical breast exams) as central to curbing the spread of breast cancer before it becomes aggressive and fatal. When Hutchinson received a mammogram reminder from her health plan months prior to her diagnosis, she added the appointment to an already bustling to-do list. Today, she is breast cancer- and diabetes-free. Published on EBONY.COM on June 26, 2014.